We have Just Sold out of Star Wars Episode VII - The Force Awakens BB-8 Droid Screw Back Stainless Steel Earrings. This Item is unavailable at present. From the Star Wars collection by Body Vibe. 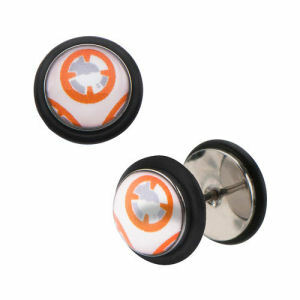 Star Wars Episode VII - The Force Awakens BB-8 Droid Screw Back Stainless Steel Earrings. Made of stainless steel.